In a media release Sunday, the Liberation Tigers said that dissidents within the renegade Karuna group killed seven associates of Mr. Vinyagamoorthy Muraleetharan (“Karuna”) because of differences within the group. The dissidents then escaped and surrendered to the Tigers in the Amparai district on Sunday morning, the release said. 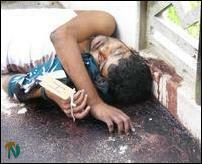 The killed paramilitary group members were identified as Kuhanesan, Castro, Kesavan, Ruban, Atparan, Vikky and Vimalkanth. Kuhanesan acted as the second in command to Karuna in the renegade group. According to reports in the Sri Lankan press and the LTTE's media release, Kuhanesan was one of the fourteen members of the renegade group arrested in June at a Buddhist temple in Hingurakgoda near Pollanaruwa, before being released at the intervention of the Sri Lanka military intelligence. The LTTE release said that according to the dissident Karuna group members who surrendered, they were accommodated at a military intelligence safe house in Kottawa, in the outskirts of Colombo. Meanwhile, Sri Lanka Defence Ministry denied the eighth man among the dead was an Army intelligence officer. "The Directorate of Military Intelligence of the Army Headquarters categorically denies Army’s involvement in the above incident and Sri Lanka Army further assures that no military intelligence operative is among the dead,” the Defence Ministry stated in a press release. However, Indian press reports said that despite Sri Lanka Army’s denials, Sri Lankan police officers pointed to the body of the eighth dead man as that of a Sinhalese at the scene of the killing in Kottawa, suggesting that the Army’s denials are not credible.